Why Use Vinyl Windows By PGT? A vinyl enclosure, with EzeBreeze Windows, is designed to compliment any screened area by allowing in pleasant weather and closing, either partially, or fully, inclement weather. As you can see, these modifications convert your porch into an Arizona Room, which is a permanent addition, costly and raises taxes. A vinyl enclosure, on the other hand, provides many of the advantages of glass windows, i.e. elimination of nearly all rain, cutting off rain and dirt and diminishing noise. However, none of the above mentioned changes are necessary. 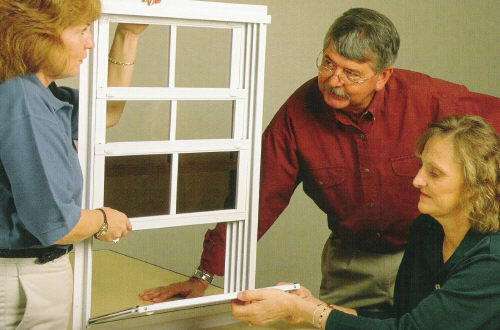 The vinyl windows are simply installed in your existing screen room without any restructuring of the room. Also, (barring a rare exception), vinyl does not increase taxes and seldom requires a permit. Because Eze-Breeze Sliding Panels are uniquely designed and custom-made, they offer you advantages no other brand of vinyl enclosure can match. They can be custom-sized to fit existing openings without expensive re-framing. Eze-Breeze Vertical Four-Tracks adjust in seconds to open up 75% of the window area to the outdoors. Eze-Breeze Side Sliders provide floor to ceiling views and ventilation. And their rugged vinyl glazing is lighter in weight than glass, making panels easy to operate and remove. When it is time to clean the windows they remove easily making the process about as easy as it gets. You can use any mild detergent or the specially formulated vinyl window cleaner, either way keeping your windows clean is easy.